A South African court has issued an interim order stopping Sudanese leader Omar al-Bashir, who faces war crimes charges, leaving the country.The court says President Bashir will have to stay until the court hears an application later on Sunday on whether he should be handed over to the International Criminal Court (ICC). Mr Bashir is in Johannesburg for an African Union (AU) summit. As the court prepared to hear the case, he posed for a group photo. Earlier President Bashir was welcomed by South African officials as he arrived in Johannesburg. He is wanted by the ICC on war crimes and genocide charges over the Darfur conflict. However, there are tensions between the ICC and the AU, with some on the continent accusing the court of unfairly targeting Africans. 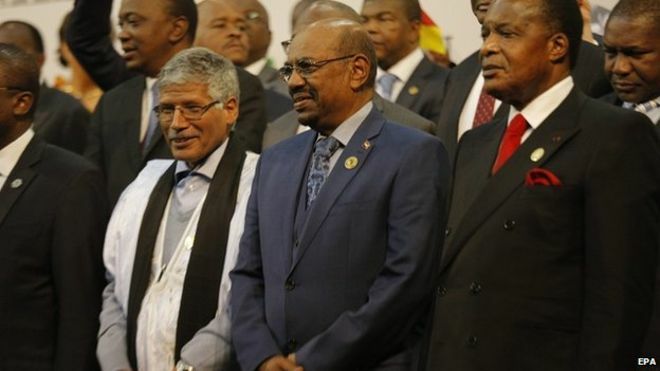 The AU has previously urged the ICC to stop proceedings against sitting leaders.